In 2011, we initiated a free, one-hour “I’m a Bear Smart Kid!” education program for classrooms where Elementary, Middle and High School students learn about black bear biology and how to avoid human-bear conflict. In recent years, the program has expanded to reach other regional communities. Read more here. A loaner bear-resistant container program was greatly expanded in 2014 with the acquisition of 32 bear-resistant containers, which were distributed to residents experiencing bear and trash issues in an outlying subdivision. The program is now available county-wide and we have 43 containers to loan out to residents in need. Read more here. This multi-year effort has been instrumental in persuading local policy makers to adopt and enforce community wildlife ordinances. Data is collected in bear season and disseminated to city and county staff and elected officials with goals of greater awareness and improved trash management practices. Read more here. We partnered with three local groups to establish a program that matches residents having excess fruit with those that could use fruit via an online bulletin board located at www.fruitglean.org. The goal is to feed community members instead of bears. Read more here. New in 2015, we proposed assisting 20 county landowners with electric fencing to protect chicken coops, bee hives, small livestock and more from bears by providing $100 worth of electric fencing materials as an incentive. In addition, installation assistance is offered. Read more here. In 2015, we began modifying a number of problematic 300-gallon trash containers that had been accessed by bears in locales where bear-proof dumpsters could not be situated. Modifications were accomplished using common materials purchased at local hardware stores. New in 2015, we partnered with the Durango Botanical Society and a local nursery to allow 50 residents to turn in over 70 bird feeders in exchange for hanging flower baskets, with a goal of reducing the number of bird feeders available to bears and to have residents attract birds, not bears. New in 2015, and to begin removing pumpkins as a human food attractant, Bear Smart Durango partnered with the CSU Extension Office, City of Durango, Healthy Community Food Systems and a local rancher to coordinate a bear-safe disposal venue for pumpkins post-Halloween at a city park. 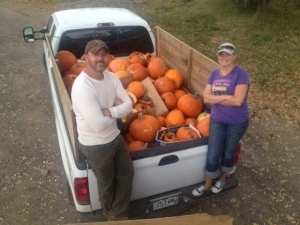 174 pumpkins that were dropped off were used to feed pigs and chickens at a local ranch. Read Durango Herald article here. The Spring Bear Wake-Up Social is an educational, family-friendly community event designed as a reminder that bears are out of hibernation and that it’s time for residents to renew Bear Smart practices. The fourth annual 2015 event took place in early June. Read more here. 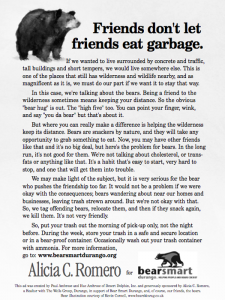 Bear Smart Durango has hosted a Be Bear Smart Week in downtown Durango in the month of August. The week features book readings, puppet shows, guest speakers, films, kid’s activities and games, all with educational components on being Bear Smart. See posters from past events. We initiated the creation of a Bear Working Group in 2011, a collaborative effort to minimize human and bear conflict in the area. Representatives of community stakeholders meet twice a year in what is in essence a de-facto government board to develop and implement creative community-based solutions. Read more here. A new initiative in 2015 allows builders, realtors and others to partner with us in getting outreach materials to new homebuyers and increase the amount of bear-proofing of trash in exchange for being rewarded via public recognition. Read more here. Educational ad for local newspapers created by Paul Ambrose and donated by Alicia Romero.